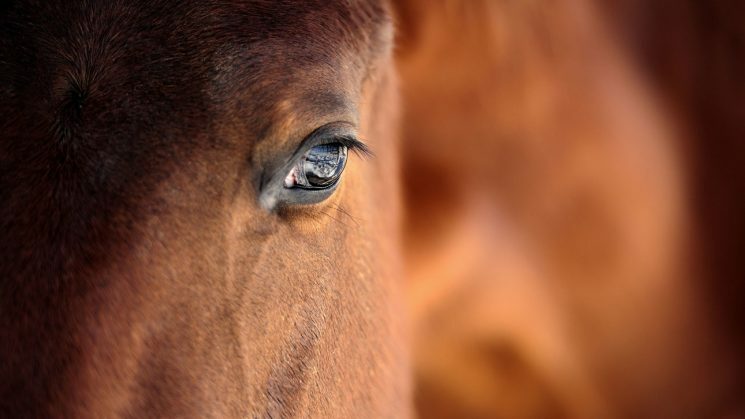 The NC State Veterinary Hospital’s equine ophthalmology service reports treating an increased number of horses with eye infections caused by fungi. Fungal keratitis can develop after an injury to the cornea. It is common in horses, but the high frequency of cases seen during the past few weeks is unusual, said Brian Gilger, CVM professor of ophthalmology. “The cause may be the recent rainy weather or lower temperatures which help promote the growth of fungi,” said Gilger. 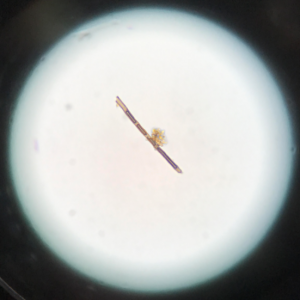 A fungal hyphae isolated from a horse with fungal keratitis. Gilger recommends owners closely monitor horses for eye pain, discoloration or increased discharge, all early signs of fungal keratitis. If concerns arise, owners should call their primary veterinarians if concerns arise. “The earlier the treatment, the better the outcome of this serious disease,” said Gilger. The Gilger Laboratory is collaborating with NC State University’s Center for Integrated Fungal Research to develop innovative diagnosis and treatment of fungal keratitis in horses. The CIFR is part of the university’s College of Agriculture and Life Sciences. For more information, call the VH ophthalmology service at 919-513-6659 or email NCStateOphthalmology@ncsu.edu. This post was originally published in Veterinary Medicine News.